Photo from Home Outside: Creating the Landscape You Love by Julie Moir Messervy (Taunton Press, 2009). Photo by Randy O’Rourke. Design by Salsbury-Schweyer, Inc.
A little deck is sometimes all you need. 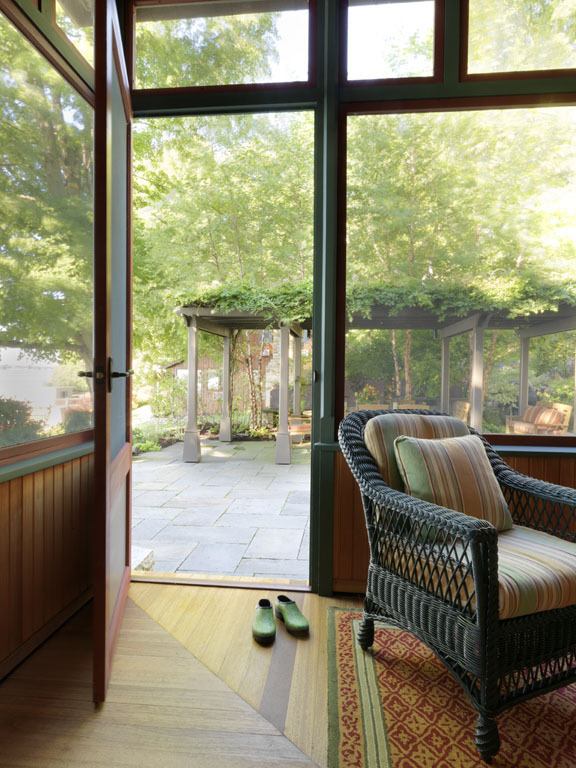 Here, double sliding doors open onto a tiny triangular deck sized just for two and surrounded by a sea of foliage. People who love plants enjoy the ‘immersed’ experience. The triangle shape of the deck provides more usable space than its small square footage suggests, and it allows people to feel embraced by greenery. One of our Home Outside designers created the design below using a simplified palette of billowing plants repeated throughout the landscape and echoed in the plantings in the small container on the deck. A small path is discreetly positioned so as not to interrupt the view. The repeating plant elements and the floating effect of the rail-less deck create a peaceful and harmonious experience. Design created with the Home Outside app. On a tiny deck, all you need is seating and a place to set your drink and a book. Patio chairs and a little table will do the trick nicely. L: This all-weather wicker and steel set takes up a small amount of space with lots of style. R: If you want seating for just one, go for a comfortable size and handsome design, like this rattan and teak lounge chair.